Last year, I opened an old cardboard box to discover a long-forgotten stuffed monkey that once belonged to my childhood dog. Perry passed away more than a decade ago, but the memory of his scent rushed back to me in an instant. The tattered, time-worn toy seemed to contain so much of the life of my beloved pet, regardless of how much time had elapsed. 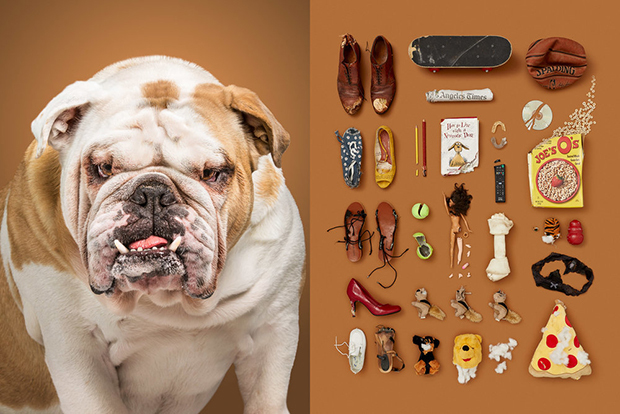 Dogs, like humans, have objects they use and cherish, and these items help define who they are. 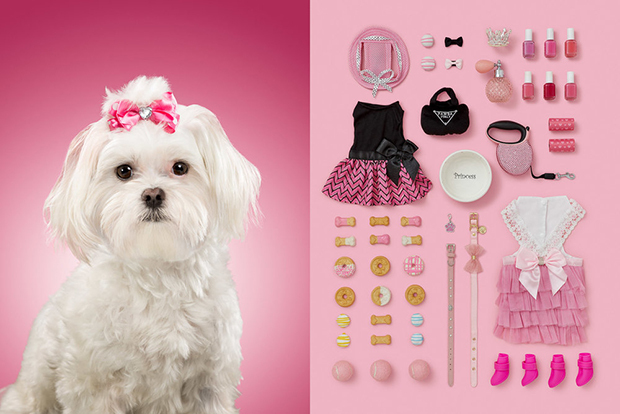 The Los Angeles photographer Alicia Rius pays tribute to this truth in her new series A DOG’S LIFE. While she didn’t get a chance to meet the dogs before their portrait sessions, Rius quickly learned their personalities. Marmaduke, a former stray who is still waiting for his forever home at Pacific Pups Rescue, impressed her with his loving disposition and his eagerness to please. 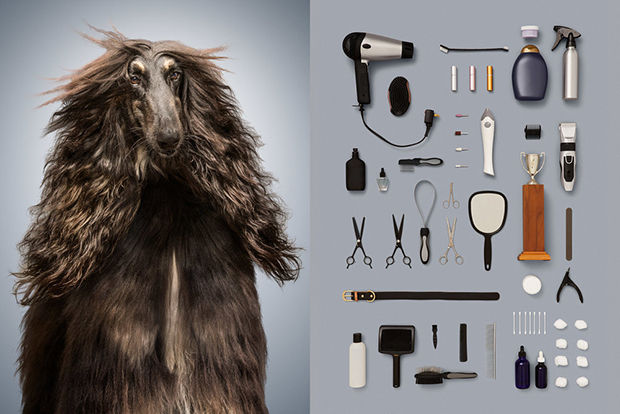 Zig, a retired show dog, was shy, but a familiar blow dryer helped him feel more comfortable. Bear, on the other hand, “could not control his excitement.” He jumped; he panted; he even bumped into various things. The senior, Magda, looked to her foster Adria for affirmation whenever she was unsure of herself, and the bond between the two of them will stay with Rius for a long time to come. Despite challenges with her health, Magda is a playful dog. “You can tell she’s the happiest she’s ever been with Adria, and Adria would say that she’s the lucky one for having her,” the artist tells me. Even while Magda was up on the table for her portrait, her foster mom remained right by her side. 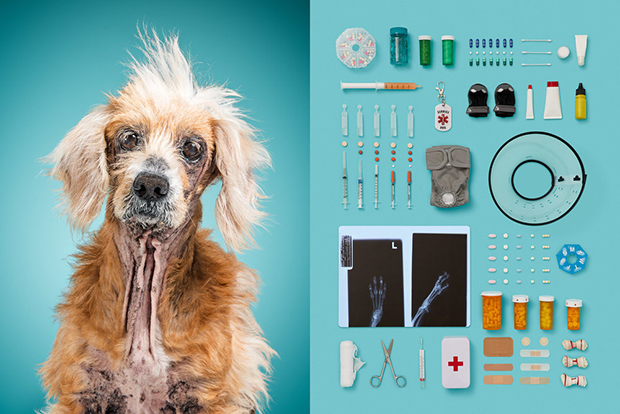 While the photographs reflect the humor and delight of life with dogs, Ruis doesn’t avoid honest references to some of the hardships these animals endure. Marmaduke was abandoned on the streets, and we can find reminders of that past in his portrait. Magda was already sick when her former owners brought her to a shelter, and she requires frequent trips to the vet to stay healthy. 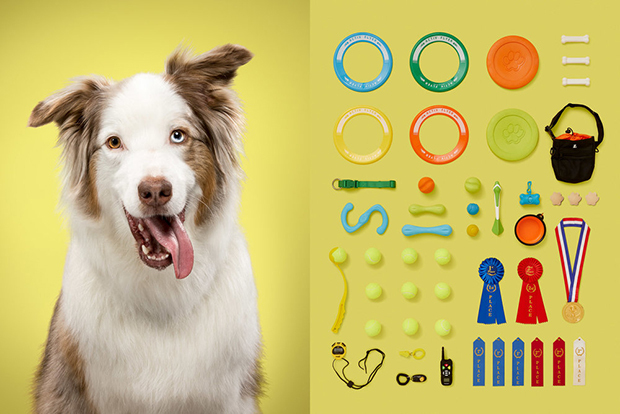 The tennis balls and the bottles of pills, representing joy and adversity, carry equal weight in A DOG’S LIFE. 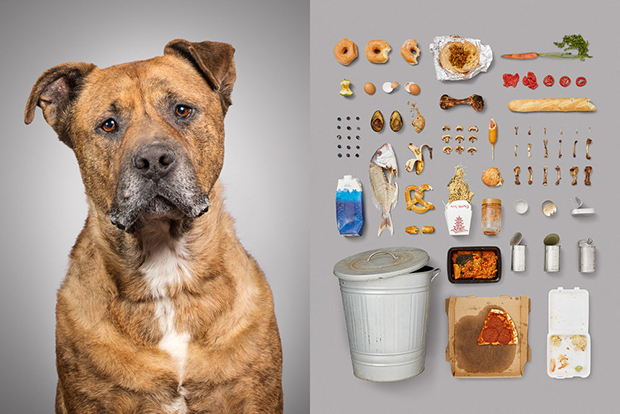 Looking at Rius’s photographs, we find a simple and essential truth: all dogs need food, shelter, good care, a few toys, and someone to love. Some might find the pictures anthropomorphizing, but anyone who has cared for a dog will understand them for what they are: an enduring testament to the dignity and the tenderness of the canine soul.